Our Resort Center offers a variety of deluxe lodging options to accommodate both large and small hunting parties. From private log cabins to “logdominium” condos and lodge rooms, you are sure to what you need. Our Club Cabins are designed to offer the ultimate in North Woods luxury! Each log cabin is tastefully furnished and decorated and offers all the creature comforts (plus a little more!) Each has a complete kitchen with pots & pans, place settings, microwave, toaster, full-size refrigerator and stove/oven, dishwasher, satellite TV, and a jacuzzi. Black Bear, Whitetail Deer: Full living room and dining area. 3 separate bedrooms – one with a queen bed, one with a single bed and one with a double bed/bunk combination. 2 private bathrooms (master bathroom has a jacuzzi). Bobcat, Lynx: Upstairs has a full living room/dining area and a complete kitchen with place settings. Two private bedrooms – one with a double bed, one with a double bed/bunk combination. Full bathroom. Downstairs has a full living room/dining area and a complete kitchen with place settings. 1 bedroom with a king bed and a master bedroom with jacuzzi. Our beautiful, natural log cabins are located along Martin Pond and the Kennebec River. Each cabin has a complete kitchen with pots & pans, place settings, microwave, toaster, satellite TV, a full-size refrigerator and stove/oven, private bathrooms, living room and dining area, cathedral ceiling and large outside deck. King Pine, Mountain Ash, Tamarack: 4 private bedrooms – 2 with a double bed/bunk combination and 2 with queen beds. Full-size loft with 2 double beds. Two bathrooms. Moose Maple: 2 private bedrooms each with a double bed/bunk combination. Full-size loft with 2 double beds. One bathroom. Partridge, Woodcock: 2 private bedrooms each with a queen and a single bed. Full-size loft with 2 double and 2 single beds. One bathroom. Adjoining the main Lodge, the Condo provides deluxe accommodations for larger groups. The large kitchen has pots & pans, microwave, toaster, full-size refrigerator, stove/oven, dishwasher, place settings, and satellite TV. Two full bathrooms. Separate full-size living room and dining area. Each of the 4 private bedrooms has a queen bed and a futon. Sits on a small bluff overlooking Martin Pond, close to the Lodge. Complete kitchen with pots & pans, microwave, toaster full-size refrigerator and stove/oven, place settings, and satellite TV. One three quarter bathroom, large living room and dining area. There are 4 private bedrooms – 2 of which have one queen bed and the other 2 have one queen bed and one single bed. Located next to the main Lodge, these min-condo units offer comfortable accommodations for up to five people. 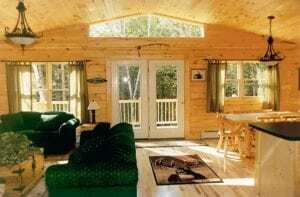 Each features a warm, wood interior with a living room and dining area, private bathroom, a kitchenette with 2 burner stove (no oven), microwave, toaster, coffee maker, studio refrigerator, pots & pans, place settings, and satellite TV. The upstairs loft has one queen bed and one single bed, and a queen bed and futon in the living room. Conveniently located in the main Lodge, these large, roomy accommodations each contain 2 queen beds, one single bed, and a private bathroom. These rooms can comfortably sleep up to 4 people and contain a satellite TV.